Did you ever start your own business? I’m sure many of you have, but not me. 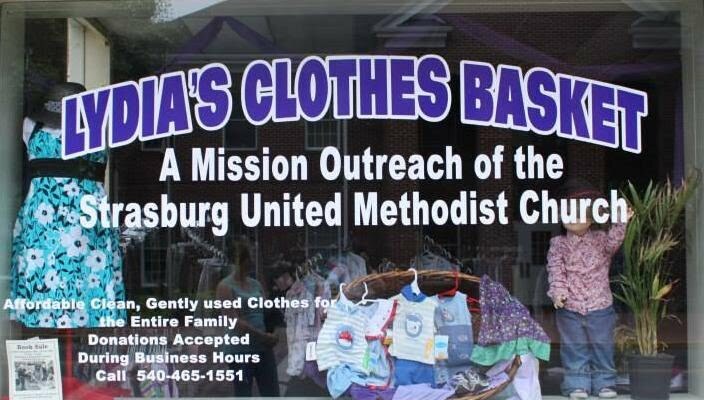 About two years ago when I was leading a Bible Study at our church, it was suggested that one way we could reach out and minister to our community was to start a clothes closet. Then suddenly in February of 2013 someone (with connections) approached me and said if we were still interested, she knew of a property that we might be able to afford. This launched a flurry of emails and phone calls to former members of the Bible Study class and others who had expressed interest in such a project. WE were suddenly on the road to opening a business – a mission to provide affordable clothing to the community in the midst of a sinking economy. Negotiations with the potential landlord, discussions with supporters, presentations to the Church Council, emails, newsletter articles – – the swirl of activity lifted me out of my depression over my health and my natural organizational skills came to the forefront. They say you can’t make a silk purse out of a sow’s ear, but I can assure you that with determination of some dedicated volunteers who have some vision and a desire to help others, you can turn a 100 year old, run down building into a retail establishment. Word travelled fast and volunteers appeared out of nowhere. Through a local retired minister with connections to a thrift shop in the next town, we acquired their supply of excess clothing racks and hangers, plus friendly advice. An off-duty nurse hanging out in a local coffee shop volunteered to help with painting and minor repairs. A retired carpenter volunteered to build shelves; bags of used clothing began appearing faster than our teams of volunteers could sort and organize them; we quickly ran out of storage space and one of our families offered to open their empty basement so we could store the winter clothing until we are ready to display it. A local journalist and photographer took pictures and saw to it that we got publicity in a local newspaper. Although the project was met with very mild doubts from a few, we were encouraged by the enthusiasm of the community in general. During the month and a half we were preparing the store, there was a rather steady stream of people inquiring how soon we would open and usually returning with gifts from their basements, closets, attics and garages. Opening day was approaching, but one element was missing – electricity. Through some apparent bureaucratic mix-up, the electric meter had been removed when the town changed electric companies and the “code” for untangling the mess had been lost. From the first of April until the middle of May, we worked in the dark, with flash lights and construction lights powered by electricity from the empty unit next door. We knew God was on our side. A business plan was written, the original Task Force morphed into a Board of Directors, our very efficient Staffing Coordinator soon had a fully staffed first month of Volunteers and our Inventory Coordinators supervised the arrangement of clothing within the store, making it look very professional. Some body offered the talents of a friend to do the lettering on the window. Ultimately, we got the blessing of the church and two groups within the church agreed to sponsor us with sufficient start-up funds to pay the first month’s rent and utilities and obtain the necessary insurance. The magic Opening Day arrived. With a minimum of meetings and the cooperation of so many people, a new business, Lydia’s Clothes Closet, was born! Thank goodness for email and cell phones, and the generosity of caring people. Do I want to start another business? Not on my own and not any time soon! But it has been a blessed experience. I have met and gotten to know many fine people who were only names and faces before. The view from the hill was quite different recently – actually it was the view on the hill. Right in my back yard! It started out a little cloudy and overcast; then the sun popped out, accompanied by a gentle breeze and a chorus of birds. The bride and groom took their places in front of a backdrop of Leland Cypress trees and a bed of perennials, and looked around nervously at the crowd of two guests. They were dressed in West Coast casual, but the bride had all the required accessories: something old, something new, something borrowed, and something blue, and the groom had the ring securely in the pocket of his Bermuda shorts. She carried a hastily gathered bouquet of fast-fading tulips and daffodils. They both looked radiant as they exchanged their vows and became husband and wife. The dogwoods and red buds, lilacs and tulips were fading, and the iris and roses were just ready to burst into bloom – soon but not today. But LOVE was in the air. Yes, we had a wedding on the hill. 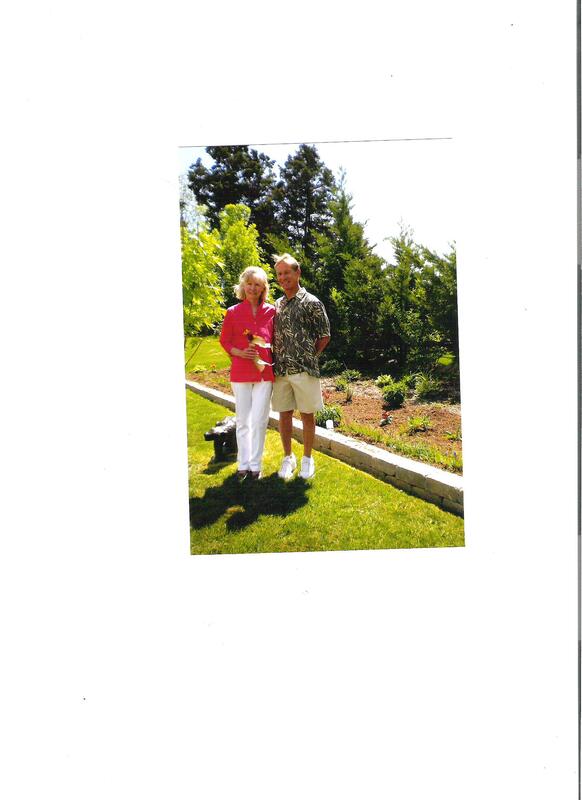 My step-son, Mike, and his bride, Karen, who live in Reno, Nevada, had come for a visit. They informed us a couple of weeks earlier that they wanted to get married here during their visit. We were very happy and excited about this, especially when they asked me, a Certified Lay Minister in my church, to officiate. What an honor! 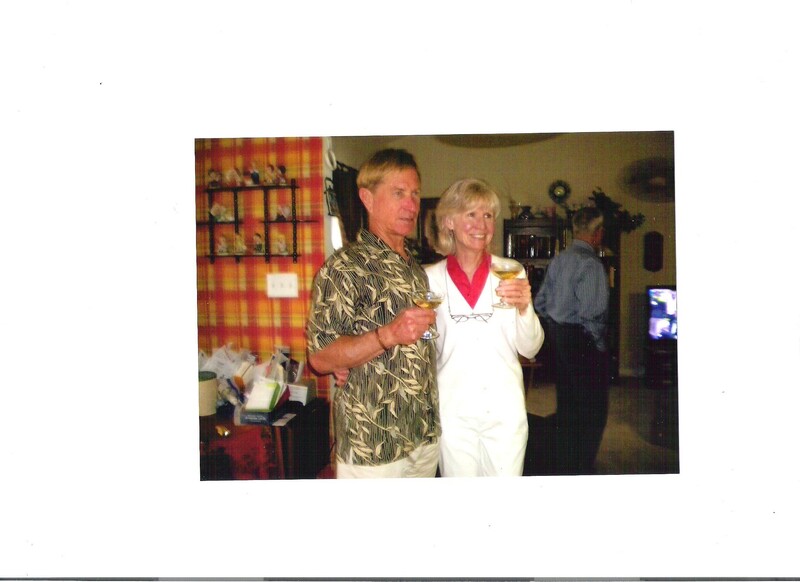 Just as I was moving into wedding and party preparation mode, Karen informed me that they wanted a very simple, intimate wedding, with only my husband and myself present. However, they did not object to a celebration with other family members after the fact. So I slowed down, ordered a catered meal, invited relatives for refreshments and “an opportunity to visit with Mike and Karen”, got my necessary certification from the Court, baked a small wedding cake and waited anxiously for flowers to bloom. Some bloomed too early and others too late, but I seemed to be the only one disappointed about that. It was a beautiful day, and after the ceremony and picture taking, the caterer and other guests arrived, and the party began. BLESSINGS to the new couple. The Hill will never be he same!